"Ceratophyllus gallinae female ZSM" by Katja ZSM: One female flea can lay up to 60 eggs per day! As the weather continues to warm, people and pets will begin to spend more and more time outdoors enjoying all that fresh air and golden sunshine. This is a great time of year for things like hiking, picnics and long walks in the park. Getting back to nature is a wonderful thing after months of being cooped up, but with it comes the problem of creepy crawlies and other assorted pests that can make your pets miserable. If not kept in check, insects like fleas and ticks can turn into a full-blown pest infestation before you know it. With that in mind, we're going to take a look at some non-toxic flea control solutions for home use to keep you and your pets more comfortable and safe from a variety of unwanted diseases. 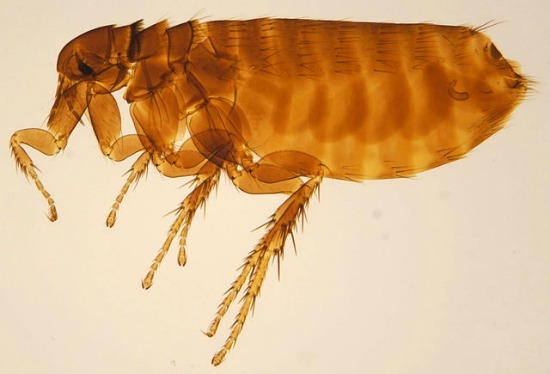 Studies indicate that fleas adapt to their environments and with each generation become stronger and more immune to the most commonly used pesticides available for controlling them. Unfortunately, just one single flea is capable of laying up to 60 eggs a day and they have a lifespan of approximately 90 days. Throw in the fact that their hibernating cocoons can live for as long as an entire year without so much as a host to feed on, and you can see how quickly a seemingly simple flea situation can soon get completely out of control and turn into a full-fledged pest infestation. If you've seen a flea or two on your pet, chances are there are way more hiding in your dog or cat's bedding and favorite napping spots. That's because this is where most of these blood-sucking parasites reside, rather than in your pet's coat. As disturbing as it may seem, statistically, for every flea found hiding on your furry little friend, there are at least 30 more hiding in your home! Grossed out yet? You should be, but there's a way to figure out the extent of your flea problem. First off, get yourself a small nightlight to plug in near your pet's bedding. Next, set a shallow bowl of mild soapy water beneath the nightlight before you go to bed. You see, fleas are attracted to sources of warm light. This attraction will have them jumping towards the light and inevitably landing in the dish. The end result is them drowning and you being able to examine the number of fleas in the water. So you've discovered the grim truth about your flea infestation; what's next? Immediately begin by sanitizing any bedding associated with your pets. This means regular washings in hot water. Additionally, if you've got them, vacuum carpets and rugs daily and keep clutter off floors in order to reduce the number of places pests can hide. After vacuuming, make sure and remove the canister or bag as soon as you're done and empty it in a trash can outside your home. Regular grooming is also especially important during a flea infestation. Bathing your pets regularly and grooming them often with an inexpensive fine-toothed flea comb helps keep down the number of fleas. If you're wondering about chemical-based flea shampoos, they're not necessary. 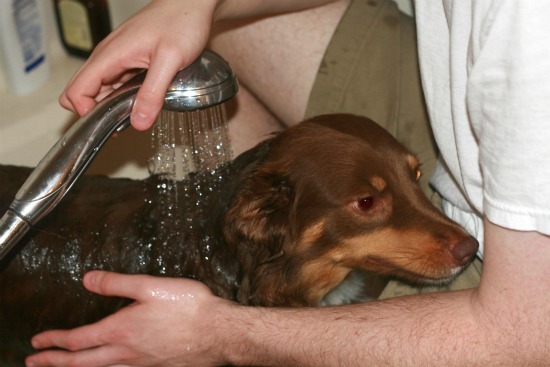 By using a gentle baby shampoo, you can reduce the number of fleas significantly. Baby shampoo has the added benefit of not washing off any commercial products that you may have already applied directly to your pet's coat, if you're using them. Many pets (and some people) suffer from what is known as flea bite dermatitis. If your pet's one of them, then you know how rapidly this can turn their skin into a mess — besides the fact that you feel terrible watching them claw helplessly at themselves. That's why it's important to act not at the first sign of fleas, but before they become a problem. 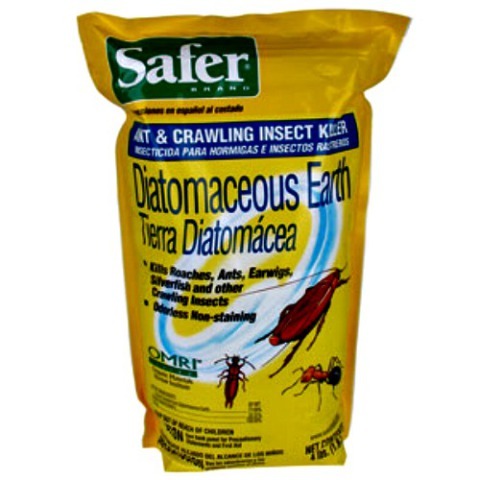 A good way to do this is by using a product known as Diatomaceous Earth. This is not the same stuff used in connection to upkeep on a swimming pool. Use the product in small amounts throughout your entire home. It's all-natural and similar to talcum powder in both appearance and feel. While it's harmless to pets and people, it is lethal to insects that come into contact with it. It works similarly to fiberglass in that it basically cuts bugs to ribbons without being visible to the naked eye. It's safe to use on all floor surfaces and should be concentrated in areas your pet usually frequents. It can even be used directly on bedding and your pet without any side effects. Electric flea traps are another thing you can and should be using to keep fleas from ravaging your pets. These inexpensive items are said to be very effective and are not harmful to humans or animals, either. They've also been known to work well on ants, too. If you live in an area that's warm year round and you're not likely to experience at least one hard freeze, then fleas can be an issue at any time of year. By using flea traps and Diatomaceous Earth, along with regular grooming and sanitizing precautions, you should be able to keep fleas at bay and improve the quality of life for your pets throughout the year. products mentioned here and check out the reviews.